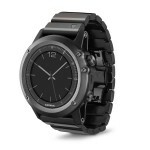 The Garmin Fenix 3 Sapphire is equipped with an omni-directional EXO GPS/GLONASS satellite antenna. This means that it�s capable of tracking location even in challenging environments where there�s no mobile wireless signal. Naturally, that makes it an ideal candidate for those interested in extreme sports. It has a 1.2-inch display which utilizes Garmin�s �Chroma� technology to remain visible even in direct sunlight. Fitness tracking is prevalent with a variety of stats to be monitored. It can also receive notifications from a connected smartphone. The real highlight is the outdoor navigation tracking thanks to a 3-axis compass, altimeter and barometer. You can even extend your experience through Garmin�s Connect IQ mobile app platform which offers additional widgets, apps, watch faces, and more.